SOUTHFIELD, Mich.--(BUSINESS WIRE)--More than 33 million autonomous vehicles will be sold globally in 2040, a substantial increase from the 51,000 units forecast for the first year of significant volume in 2021, according to the latest autonomous vehicle sales forecast from business information provider IHS Markit (Nasdaq: INFO). Key market dynamics influencing growth are accounted for in the latest analysis from IHS Markit. The rapid convergence of autonomous driving and mobility services such as ride-hailing is a central driver of early deployment and growth. The United States will lead the world in initial deployment and early adoption of production autonomous vehicles as early as 2019, while Europe and China are expected to begin adding considerable volume from 2021 onward. Mobility-as-a-Service will first bring this technology to the masses before individual ownership of autonomous vehicles enters the picture. Significant ongoing investment in transportation technology by OEMs, suppliers, mobility service providers and technology companies contributes to earlier deployment timelines, while dedicated mobility service brands within many automakers contributes to higher volumes of autonomous vehicles in the forecast. The IHS Markit analysis reflects partnerships and ecosystems forming around technology and services that will help the industry address the complex challenges around the evolution of autonomous mobility. All of these are contributing factors to the forecast, which also incorporates a new demand-driven methodology, as the industry shifts from thinking exclusively about unit sales to usage per distance or time. The forecast also includes a breakdown of Levels 4 and 5 of the industry-standard Society of Automotive Engineers Levels of Automation. The U.S. market will see the first autonomous vehicle sales in the world, the IHS Markit forecast says, as many individual states and the nation as a whole are expected to adopt an industry-friendly regulatory approach. The first uses will be in mobility service fleets, which will provide early hands-on experience with the technology and help reduce consumer skepticism. Announcements from General Motors, Waymo and Uber contribute to early projected mobility fleet volumes in 2019 before personal autonomous vehicles become available as early as 2021. Total U.S. volumes of autonomous vehicles are expected to reach 7.4 million units per year in 2040. Mobility services have taken hold in many Chinese cities already, and driverless variants are expected to maintain popularity with consumers. Additionally, the automotive and technology industries are aggressively closing the gap in key sectors including autonomous driving and artificial intelligence. Regulations on autonomous vehicle testing and deployment are expected soon in China, and will provide clarity for the industry to reach 14.5 million autonomous vehicle sales in 2040. European regulations are an obstacle to the same ride-hailing services that will drive initial deployment in the U.S., but European markets are especially strong in technology-rich luxury brands. As a result, according to the forecast, the balance in Europe will tip toward personally-owned autonomous cars over driverless mobility fleets, amounting to 5.5 million autonomous vehicle sales annually in 2040. A variety of factors will limit adoption of autonomous vehicles in other global markets, according to IHS Markit, including the presence and strength of the local automotive industry, regulations governing autonomous driving and/or mobility services including ride-hailing, and the complexity of local driving conditions. While many countries including Japan, South Korea, Australia and Canada will have a mix of favorable conditions that introduce autonomous vehicles locally as early as 2022, most global markets are expected to experience more roadblocks that bring late initial deployment and low adoption of autonomous driving overall. 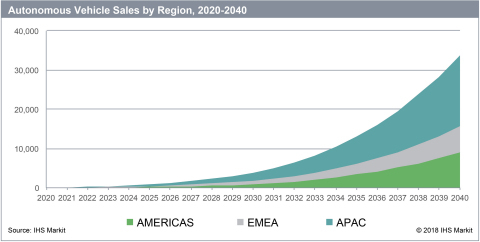 In 2040, IHS Markit forecasts autonomous vehicles sales in other global markets to reach nearly 6.3 million per year combined, compared to more than 27.4 million between the U.S., China and Europe.